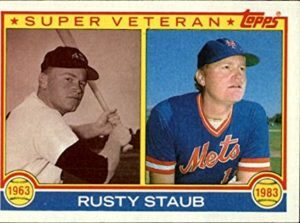 Terrible news to pass along on Opening Day, but beloved Met icon Rusty Staub, who powered the 1973 champions before a second act as a veteran pinch-hitter launched their glory run in the 80s, reportedly passed away early this morning in Palm Beach Gardens, Fla. at age 73. For those of us who can remember seeing him play when he was young(-ish), Staub was a terrific all-around player, combining power, a keen batting eye, and a strong arm in the outfield. He was acquired by the Mets from Montreal in a fateful trade on the eve of the 1972 season. He was the first member of the Mets to drive in 100 runs in a season (105 in 1975); a rugged hero of the 1973 team remembered for sacrificing his shoulder in a violent collision with a wall, but soldiered on to a terrific postseason despite having to throw underhanded. He was a real gamer. A cheap front-office skittish about 10-and-5 rights and Staub’s history as a tough contract negotiator foolishly dealt him to Detroit prior to the 1976 season, but when reacquired as a free-agent in 1981, Staub provided a dangerous reserve bat, was a strong advocate for players at a dangerous time to be one, and a warm presence that helped to steel the eventual 1986 World Champions. Staub by then had become a beloved figure in New York, famous for his restaurants and charitable endeavors including establishing a fund to support the families of police and firefighters killed in the line of duty. Staub was also an active Mets alumni. He was named to the team’s Hall of Fame in 1986. Rusty preferred to wear No. 10, but wore No. 4 in 1972 and 1973 in deference to reserve catcher Duffy Dyer, who had that number when Staub first arrived. It took some time to unpack this but it turns out Rusty was just as hard licencing his image to card publishers as he was selling his talents to baseball teams, which is what got him traded so often. A dispute with Topps resulted in the company not issuing Staub cards in either of the 1972 or 1973 sets. Dave Murray writes about that incident — and another horrifying baseball card story on Rusty — here. Let’s hope the Mets can tastefully and respectfully remember their dignified and principled star this year. Would an orange armband suffice? An Orange #10 would be nice to see.